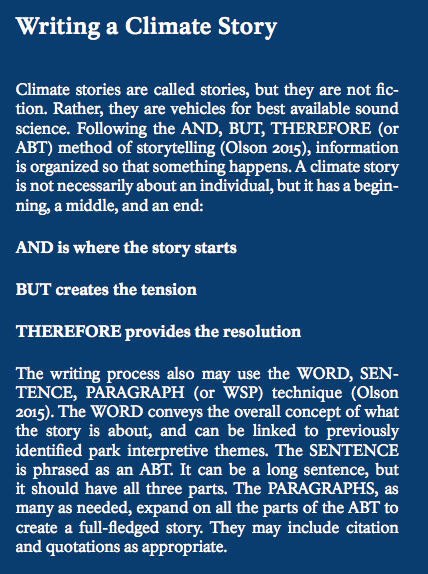 You will have three opportunities to practice creating an ABT narrative. 2 narratives - Deepen the class's understanding of collapse and sustainability around the world by investigating and presenting several short (5-7 minute) case studies of collapse or sustainability. Use the ABT approach in your presentation. May be developed individually or in a group of two or three. Ten points per presentation. Notify instructor at least one day in advance. 1 narrative - Please prepare a short talk with your research team using the ABT method to communicate the results of your group's research. This presentation will account for 5 points of the 25 points offered for the Research Report. Please read the "ABT Reading" in Canvas to learn the method. Visual aids (e.g., Powerpoint) may be helpful for clarifying and explaining your narrative. Create a narrative you'd want to hear and see! The emphasis is on effective communication.